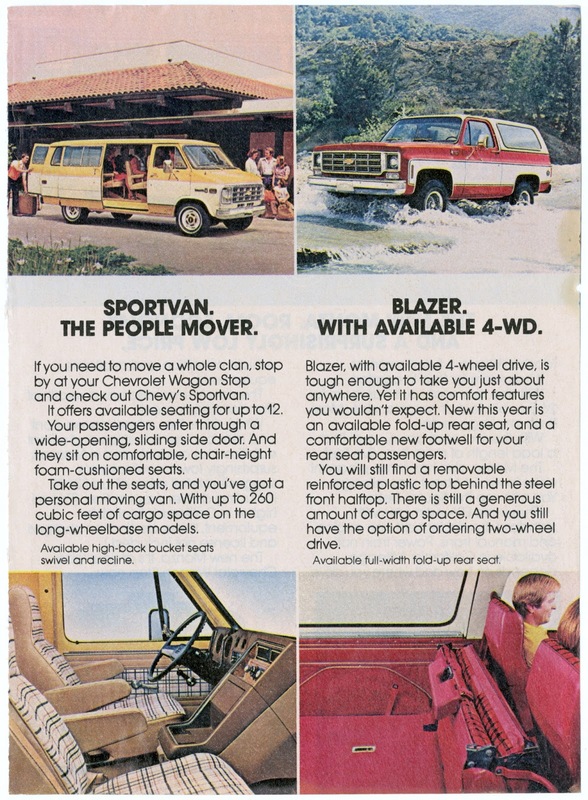 If you need to move a whole clan, stop by at your Chevrolet Wagon Stop and check out Chevy's Sportvan. It offers available seating for up to 12. Your passengers enter through a wide-opening, sliding side door. And they sit on comfortable chair-height foam-cushioned seats. Take out the seats, and you've got a personal moving van. With up to 260 cubic feet of cargo space on the long-wheelbase models Available high-back bucket seats swivel and recline. Blazer, with available 4-wheel drive, is tough enough to take you just about anywhere. Yet it has comfort features you wouldn't expect. New this year is an available fold-up rear seat, and a comfortable new footwell for your rear seat passengers. You will still find a removable reinforced plastic top behind the steel front halftop. There is still a generous amount of cargo space. And you still have the option of ordering two-wheel drive. Available full-width fold-up rear seat.